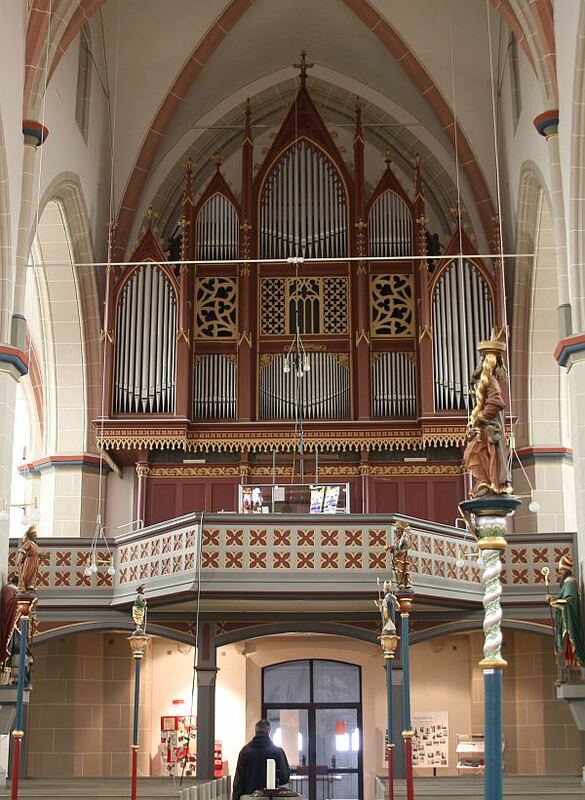 Description: The organ in the Catholic Church of Dingelstädt, Germany, was built by Anton Feith (1902-1979) in 1932/33. It was recently restored by Karl Brode, Orgelbaumeister from Heiligenstadt, who brought back the original disposition of the instrument. The instrument has 3 manuals, pedal and 45 speaking stops, numerous playing aids and couplers. Its tonal characteristics is predominantly of a German Romantic style, but influenced by many other concepts. Feith had his own thinking about organ sound, he was very creative in this point. In Dingelstädt, we hear many inspirations. There are romantic components. Thereto some parts of a neobaroque concept, the mutations, the Glöckchen 1', the Terzian. The influences of a theater organ style: the whole organ in a swell box, the unusual character of the divisions like Main, Accompaignment, Solo, the Tibia clausa-like flutes, etc. And the original tremulant for the entire organ. The layout of the divisons is the following: the lowest part of the organ case is occupied by the pedal stops, the accompaignment division operated from the lowest keyboard sits above it. The upper floor of the organ case is reserved for the divisions of the 2nd and 3rd keyboards, both are enclosed in a single swell box. Originally, however, the whole organ was enclosed in a large swell box, with a mute facade in front of it. We have chosen to model this behavior for our Hauptwerk model. The swell pedal works on the entire instrument, including the pedal stops, exactly as Anton Feith designed it. Alternatively, a dedicated switch changes the swell pedal to act on 2nd and 3rd manual only, what mimics the operation of the instrument nowadays. We also added an artificial tremulant for the IInd manual, to get the model closer to the original Feith design. Each division has its own characteristics: 1st manual is a mezzoforte division to accompany the congregation. 2nd manual is a color division. 3rd manual is the most intense division, offering solo stops as well as the most powerful stops of the organ. Its Tuba stands on a higher pressure than the Trompete on the 1st manual, its Mixtur forms the crown of the plenum of the entire organ. The samples are offered in 48kHz/24bit resolution. The multiple releases have three levels: short, mid and long. Hauptwerk v4.2 and higher supported. The sample set is encrypted, which means that it can be used with Hauptwerk Basic or Hauptwerk Advanced versions exclusively. Hauptwerk Advanced version is strongly recommended, the Basic version is not suitable to run the Surround variant of the sample set (memory limitations, audio channels limitations). There is no use of the sample set possible in any other software. The reverb time is ca. 4 seconds. The original compass of the keyboards is 56 keys. Most stops of the 3rd manual have inner extension up to 68 pipes for the use with the super-couplers. The original compass of the pedal division is 30 sounding tones. All ranks of the 3rd manual were recorded with and without tremulants for the most convincing tremulant behavior. However, loading tremmed ranks consumes large amount of RAM. It is possible to select to use the artificial tremulant instead to save RAM (the switch is located on the mixer tab). Please note, the Tuba and the Geigenprinzipal do not react to the tremulant, standing on a separate high pressure windchest.